Tickets are also available for cash at TCA and Undercover Rock. The bar will be open from 1800hrs, before the show. A maverick bunch of Brits go big wall hunting in Brazil. Lead by pioneering legend Mike ‘Twid’ Turner accompanied by Steve Long who invite some youth on the trip in the form of the super strong James Taylor and Angus Kille (just climbed Indian Face!). In an era where searching out and developing new routes seems out of vogue: all is not lost as we meet Anna Taylor. This remarkable Lakes-based 20 year old is bucking all the tends with stunning new sport routes and bold traditional lines including a nervy introduction to Deep Water Soloing by climbing partner Neil Gresham. The ultra pragmatic Tim Howell is a specialist in climbing cliffs and jumping from the top of them, commonly known as ‘climb to base’. This short film introduces us to Tim’s way of life and his long-term goal of being the first to climb and jump all six of the classic alpine north faces. Bristol's Hazel Findlay enjoys an epic day of mountain running and solo climbing in the Welsh mountains of Snowdonia. Stunning shots combine with a considered soundtrack underpinned by a subtle environmental message. The film follows Robbie Phillips, Calum Cunningham and Alan Carne as they attempt to open a new climb, ground up, on a 700m Big Wall called Tsaranoro Atsimo in Madagascar. The walls of Tsaranoro are as wild and bold as the country, the rock beautifully carved as if by providential hand. Once the free climbing begins disaster strikes, Alan takes a bad fall shattering his lower right leg, an epic ordeal unfolds to get Alan from the remote big wall to safety. This lecture is NOT in our normal venue, it's at BGS. Check our venue pages. Hi, thought this Lecture may be of interest http://www.wildernesslectures.com/speaker.php?id=245 ----------------------------- Tickets are also available for cash at TCA and Undercover Rock. The bar will be open from 1800hrs, before the show. The Brit Rock Film Tour is back for 2018 with its strongest line up to date. The films this year are Brazilian Line A maverick bunch of Brits go big wall hunting in Brazil. Lead by pioneering legend Mike ‘Twid’ Turner accompanied by Steve Long who invite some youth on the trip in the form of the super strong James Taylor and Angus Kille (just climbed Indian Face!). Just Anna In an era where searching out and developing new routes seems out of vogue: all is not lost as we meet Anna Taylor. This remarkable Lakes-based 20 year old is bucking all the tends with stunning new sport routes and bold traditional lines including a nervy introduction to Deep Water Soloing by climbing partner Neil Gresham. North Base The ultra pragmatic Tim Howell is a specialist in climbing cliffs and jumping from the top of them, commonly known as ‘climb to base’. This short film introduces us to Tim’s way of life and his long-term goal of being the first to climb and jump all six of the classic alpine north faces. Whiz Kid: Rainshadow In 2016 at the age of just 17, William Bosi became the youngest Brit to climb the ultimate magic grade: 9a. Whiz Kid: follows William’s journey to climb Steve McClure’s Malham test piece, Rainshadow. 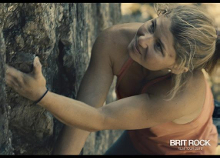 Documented in an observational style the film gently reveals what it takes to climb at this level. Free Flow Bristol's Hazel Findlay enjoys an epic day of mountain running and solo climbing in the Welsh mountains of Snowdonia. Stunning shots combine with a considered soundtrack underpinned by a subtle environmental message. Blood Moon The film follows Robbie Phillips, Calum Cunningham and Alan Carne as they attempt to open a new climb, ground up, on a 700m Big Wall called Tsaranoro Atsimo in Madagascar. The walls of Tsaranoro are as wild and bold as the country, the rock beautifully carved as if by providential hand. Once the free climbing begins disaster strikes, Alan takes a bad fall shattering his lower right leg, an epic ordeal unfolds to get Alan from the remote big wall to safety. Undiscovered Dave MacLeod has spent the past 25 years putting up cutting edge routes all over the world but most frequently on his native Scottish rock. ‘Undiscovered’ explores the passion for pioneering first ascents and examines the effort that goes into developing new routes as Dave unearths more jewels on the crags that seemingly just keep on giving. This lecture is NOT in our normal venue, it's at BGS. Check our venue pages.